The Table of Lesson Plans (pdf) provides an overview of the six lessons designed to supplement the “Karst in the Ozarks” documentary. This table outlines lesson topics, content, and vocabulary, plus specifics on how each lesson meets Missouri science grade level expectations (GLEs), complete with strand numbers. Lesson details are found in links in the right-hand column. Use this simple, 10-question pre-post test (pdf) to gauge your students knowledge of karst, before and after watching the video. Answer key (pdf) available here. This curriculum is suitable for grades 7-12, although several of the lessons can easily be adapted for grades 4-6. Lessons are hands-on, interactive, and meet numerous learning styles. All lessons have been pilot-tested by curriculum writer Mary Ann Mutrux. 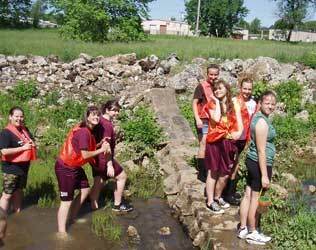 Above: Eighth graders at Willow Springs Middle School took a “water wonder walk” after a rain. Curriculum writer Mary Ann Mutrux is an award-winning teacher with 25 years experience, who currently teaches eighth grade science at Willow Springs Middle School in Willow Springs, Mo. 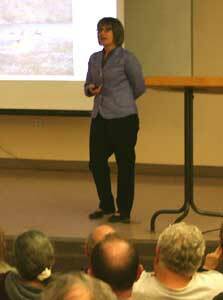 She also teaches Earth Science for Teachers at Missouri State University – West Plains and she has given numerous presentations at professional development conferences and workshops for teachers. Link to Credits: Complete credits as seen at video’s end. Includes published reference materials. “Karst in the Ozarks” curriculum materials may be printed and copied for classroom or other educational purposes. Both video and curriculum are copyrighted; they may not be otherwise reproduced, altered, or any part of them used in another production or put to any commercial use without written consent. Students study the geological history of the Missouri Ozarks, then demonstrate their learning by reorganizing sections of scrambled tables that describe rock layers and fossil history. During this lab activity, students use observation, simple tests, and a chart to identify four common Ozark rocks. Each student will study one of the endangered or threatened cave species featured in the video, then write a poem about the critter. In a small-group “game” students will draw cards and discuss scenarios presented on the cards. They will determine if the scene describes a “Karst King” or “Karst klutz.” (Person whose actions show they do or do not understand the surface-groundwater connection). Offers guidelines for taking a school/campus “Water Walk” after a rain in order to identify runoff patterns and nonpoint source pollution. Provides a checklist so students and their families can conduct a home inventory to identify best and poor practices for protecting groundwater quality.